This screen allows you to import crude from foreign markets or export to them. Importing crude is extremely expensive, and it is generally a better choice to deplete oil from land plots. However, there is no limit to the amount of crude you can import, and you can get mass quantities very quickly. Exporting will yield a very low profit margin, but it can be a good idea if you need quick money and you don't want to bother with loans. 3. Import Price / Gallon: The cost to import 1 gallon of crude oil. When importing mass quantities, importing costs can be very high, exceeding $0.300 per gallon. If you manage your land plots well, depleting oil can cost as little as $0.010 per gallon, so you'll often want to use your land plots whenever possible. 4. Maximum Importable Gallons: The maximum amount of crude oil you can import this turn. The only factor in this is the amount of cash you have available, so if you have $1 billion in cash, and the import price is $0.200, you can import a maximum of 5 billion gallons of crude oil. 5. Export Price / Gallon: The price you can sell 1 gallon of crude oil. Export prices are usually very low, often below $0.100 per gallon. Even though you can make a profit by depleting oil from your land plots and exporting the crude, you'll make far more money by refining the oil into various products and selling it. 6. Crude in Stock: The amount of crude you have in stock, either from importing or from your land plots. 7. Average Crude Cost: The average cost per gallon of the crude you have drilled / imported. This figure is one way to determine if you are using your money efficiently to get crude - if your average crude cost is high (>$0.100), you may want to make sure you're not spending too much on surveying or buying plots or drilling wells. You should try to keep this figure as low as possible. 8. Storage Available: The amount of storage you have available for additional crude. This is equal to the number of storage units times 15,000,000 minus any crude or products you already own. 9. Crude to Import: The amount of crude you have ordered to import this turn. 10. Crude to Export: The amount of crude you have exported this turn. 11. Demand for Crude: The current demand for crude oil overseas. You cannot export any amount beyond this figure. 12. Import Crude button: Click this button to import crude. See Importing Crude below. 13. Export Crude button: Click this button to export crude. See Exporting Crude below. 14. Close button: Closes the current screen and returns you to the main menu. 15. Toggle Main Menu button: Opens the main menu without closing the current screen. If the main menu is already shown, clicking this button will hide the main menu. 16. Import / Export Graph: Displays the trend in crude import and export prices over the past 12 months. The white line indicates the import price, while the blue line indicates the export price. To highlight a particular line, click on legend display on the right for the line you wish to highlight. To hide a line, right-click the legend display for the line you wish to hide. To begin importing crude, click the "Import Crude..." button. The graph on the bottom of the screen will be replaced with a place where you can provide the number of gallons you wish to import (shown below). Type in the number of gallons you wish to import and click OK (or press Enter). The screen will also show how much money it will take to import the amount of crude specified. Clicking the "Maximum Importable" button specifies the maximum number of gallons you can import. 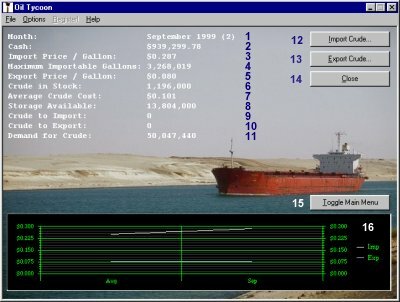 To begin exporting crude, click the "Export Crude..." button. The graph on the bottom of the screen will be replaced with a place where you can provide the number of gallons you wish to export (shown below). Type in the number of gallons you wish to export and click OK (or press Enter). The screen will also show how much money it will take to import the amount of crude specified. Clicking the "Maximum Exportable" button specifies the maximum number of gallons you can import. In addition to crude quantity restraints, you cannot export beyond the demand for crude for that month.